Alright, well I set up a Flikr account to post my pics that way. So I'll be giving you a little photo scrapbook of my trip over the next few days if you can bear with me as I get my act together. 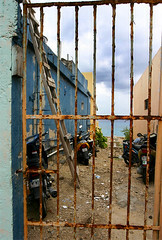 I spotted these motorcycles leaning against the sides of old buildings through the metal gate I passed in Cozumel. You can click on the photos for an enlarged view. 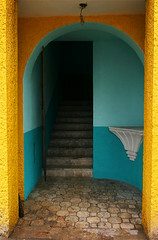 This was a doorway I walked past while ambling through the streets of Cozumel. I'm a fan of the colors and the texture. 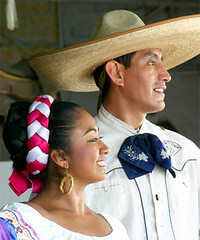 That was one of the best things about Mexico, for me. All of the color. 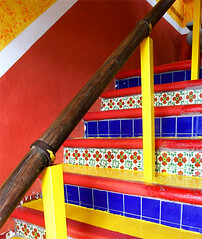 I like the photo, I think, but I would like it a lot better if the wooden handrail didn't cut through the center. It is just me or does it bother anyone else? Love these pics! Thanks for sharing.